If all the items of money or property constituting the corpus of a foreign trust are transferred to the trust by a U.S. person, the entire foreign trust is a foreign trust created by a U.S. person. Where there are transfers of money or property by both a U.S. person and a person other than a U.S. person to a foreign trust, and it is necessary, either by reason of the provisions of the governing instrument of the trust or by reason of some other requirement such as local law, that the trustee treat the entire foreign trust as composed of two separate funds, one consisting of the money or property (including all accumulated earnings, profits, or gains attributable to such money or property) transferred by the U.S. person and the other consisting of the money or property (including all accumulated earnings, profits, or gains attributable to such money or property) transferred by the person other than the U.S. person, the foreign trust created by a U.S. person shall be the fund consisting of the money or property transferred by the U.S. person. For purposes of United States tax laws, a U.S. person includes U.S. citizens, resident aliens of the United States, domestic trusts, domestic estates, and domestic entities. As a general rule, U.S. persons are subject to taxation on their worldwide income regardless of where it’s earned or where they actually physically reside in the world. U.S. persons that have an interest in foreign financial accounts and meet specified reporting requirements must submit Form 114, Foreign Bank and Financial Accounts (FBAR) annually. Moreover, specified individuals, which include U.S. citizens, resident aliens, and certain non-resident aliens that have an interest in specified foreign financial assets and meet the reporting threshold must file annually Form 8938, Statement of Specified Foreign Financial Assets. Foreign trusts with U.S. person beneficiaries fall squarely within these reporting requirements if specified reporting thresholds are met. Likewise income tax law applies to the income or earnings of foreign trusts with U.S. person beneficiaries. For purposes of United States tax laws, if a nonresident alien has a U.S. residency that begins within five years of them directly or indirectly transferring property into a foreign trust, property transferred into such trust is treated as though it was transferred into the trust as of the date of the nonresident’s U.S. residency. Undistributed net income for periods before the nonresident’s U.S. residency is treated as property transferred into such trust in determining the trust corpus. But prior to residency undistributed net income is not accounted for with regards to income taxation. Pre-immigration trusts must comply with special tax rules in order to avoid unintended tax consequences. With respect to individuals who are U.S. citizens or lawful permanent residents of the United States who has a domestic trust that becomes a foreign trust during the person’s life time, U.S. foreign trust tax laws applies as if such individual transferred property to such trust on the date such trust becomes a foreign trust an amount equal to the portion of such property previously transferred by such individual to such trust. 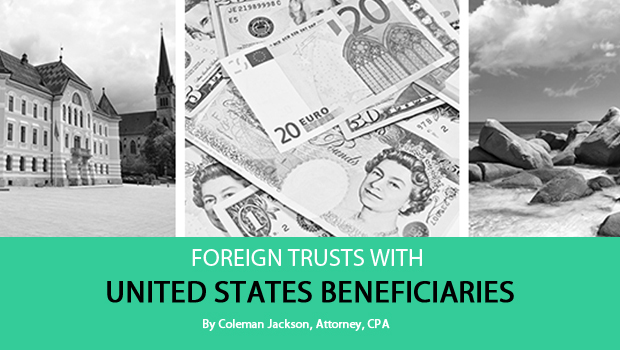 If a United States person directly or indirectly transfers property into a foreign trust, with a few exceptions, the U.S. Treasury will presume that the trust has United States beneficiaries for U.S. taxation purposes. To rebut this presumption, the beneficiaries must submit timely, credible and sufficient rebuttal information to the Internal Revenue Service when challenged. This entry was posted in Business Structuring And Estate Planning, Offshore Assets and Accounts Disclosure, Taxation on January 29, 2015 by Coleman Jackson. A nonresident alien individual who at anytime during the tax year is engaged in business or trade within the United States of America is subject to a 30% flat tax on aggregate income or gains depicted in U.S. Treasury Regulation 1.871(a) (1), and paragraph (b) or (c) of Section 1.871.7 or gains associated with sale or trade of capital assets as depicted in Treasury Regulation 1.871 (a) (2). The regulations and rules likewise applies to nonresident alien students or trainees in American institutions who are deemed under Internal Revenue Code Section 871 (c) and Treasury Regulation 1.871-9 as engaged in a trade or business in the United States . If the student or trainee is deemed engaged in a trade or business under these regulations, aggregate income or gains are subject to a 30% flat tax. 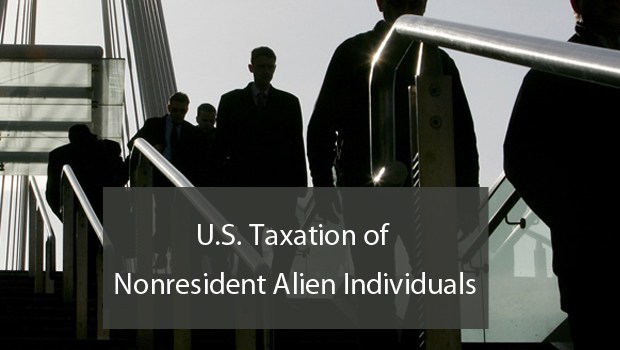 Nonresident aliens who are not engaged in a U.S. trade or business are also subject to this 30% flat tax on the aggregate income or gains if they have an effective election under IRC 871(d) and Section 1.871-10 with respect to real estate income. (b) The income which is not effectively connected with the U.S. trade or business. Failure to comply with these tax segregation rules or failure to properly report income or file tax returns could result in an IRS audit, violation of non-immigrant visa terms and other difficulties for nonresident alien individuals visiting, studying or otherwise enjoying a nonimmigrant status in the United States. This entry was posted in Taxation on January 24, 2015 by Coleman Jackson.